For a soldier in the Russian army during World War I, desertion was one of the most active means he could use to influence his often miserable fate, which makes desertion in its way interesting as an extreme kind of war experience. For Russian military and civil authorities, on the other hand, desertion was one of the major problems to the detriment of the war effort, and the fight against it was ultimately unsuccessful or even backfired, such as was the case with the reintroduction of corporal punishment of soldiers. Ultimately, widespread desertion contributed significantly towards the dissolution of the Russian Army and the Russian state itself. This article focuses on a small and somewhat unusual category of Russian deserters: the ethnically Estonian soldiers who served in the Russian border guard regiments in Finland and deserted (as did many of their Russian comrades) over the Finnish border to Sweden. For neutral Sweden, this way of escaping from Russian military service created an unexpected problem, since there were initially no regulations in place as to what to do with caught deserters. In this article I consider how the Swedish authorities – the Civil Ministry and the General Staff – dealt with this challenge and how the deserters were treated in their new country of residence. At the same time, I focus on the deserters themselves: their individual backgrounds and the reasons for desertion, which also casts light on the circumstances prevailing in the Russian Army. Russian deserters started arriving in Sweden in larger numbers from the spring of 1916 onwards. The border guard outposts in Finland were strengthened with new soldiers, many of whom sensed a good opportunity for easy escape over the border. Originally, deserters who had been caught were allowed to stay close to the border on the Swedish side. From November 1916 onwards, however, when desertions became more frequent, it was deemed a security risk and the deserters were thereafter sent to the south of Sweden and interned in the Malmö area. This system functioned well until about the Russian February Revolution. After that, the number of new deserters was reduced to almost nothing, and the deserters already interned in Malmö started leaving their allocated places of residence and work, probably with the intention of returning to Russia, where amnesty had been declared for deserters and shirkers. In most cases, the men were caught again and deported to Finland or Russia with the help of Swedish authorities. The ethnically Estonian deserters who managed to escape to Sweden were treated the same way as their comrades of Russian and other nationalities who had also deserted. The stories of their escape or other background information that can be discerned from interrogation protocols are not particularly different from those of other deserters. Their relatively large percentage among all Russian Army deserters, however, must mean that the number of Estonians in the regiments in Finland must have been significant. An analysis of the motivations behind the Estonians’ decision to desert shows that by far the most important factor was harsh conditions in the army: low pay, bad and insufficient food, hard exercise and especially corporal punishment of soldiers by officers. National conflicts between Estonians and Russians probably also played a certain role, making military service even more unbearable for Estonians. A major indirect influence was certainly the location of the outposts close to the border, which probably made the idea of deserting much more attractive. The Swedish approach to the problem of deserters was characterised by relative mildness and, at least in the beginning, somewhat ad hoc solutions. As time went by, however, Swedish policy became stricter and a form of internment was instituted. At the same time, the General Staff’s intelligence department tried to take advantage of the deserters’ knowledge about Russian forces in Finland. Local Swedish authorities, however, could be much more lacklustre in their attitude towards the deserters. The men themselves who had escaped to Sweden seem to have been relatively satisfied with their treatment, at least until the Russian February Revolution. 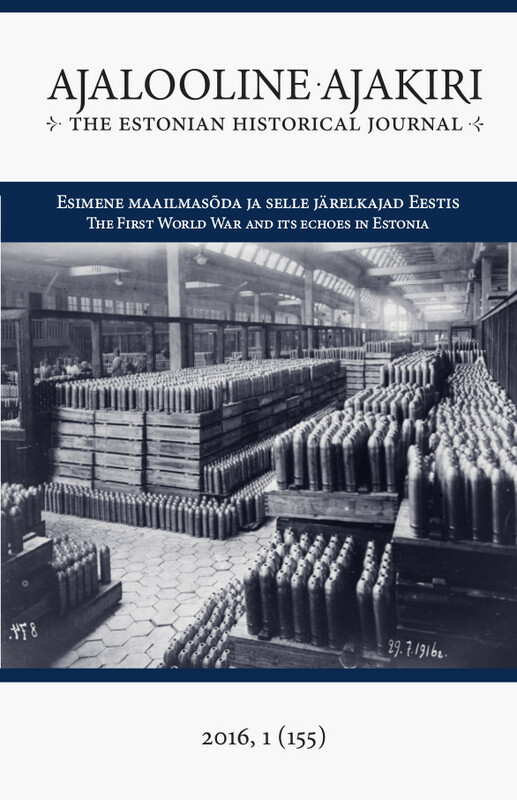 The story of the Estonian deserters in Sweden makes a small contribution to our still relatively poor knowledge of the fate and war experience of Estonian soldiers in World War I. However, research in this field must continue to be enriched with other case studies and eventually also generalisations. From the perspective of the Swedish authorities, the situation was handled quite successfully, even though the fears of espionage were likely exaggerated and the internment of deserters in Malmö probably made no real difference. At the same time, however, the case is symptomatic as an example of the kind of entirely unexpected problems that a state that had remained neutral in the war had to handle and come to terms with.